This week’s challenge is Fleeting. Couple weeks ago I woke up early in the morning and grabbed my camera after Fajr prayer. I asked my brother in law, Angga, to go with me. 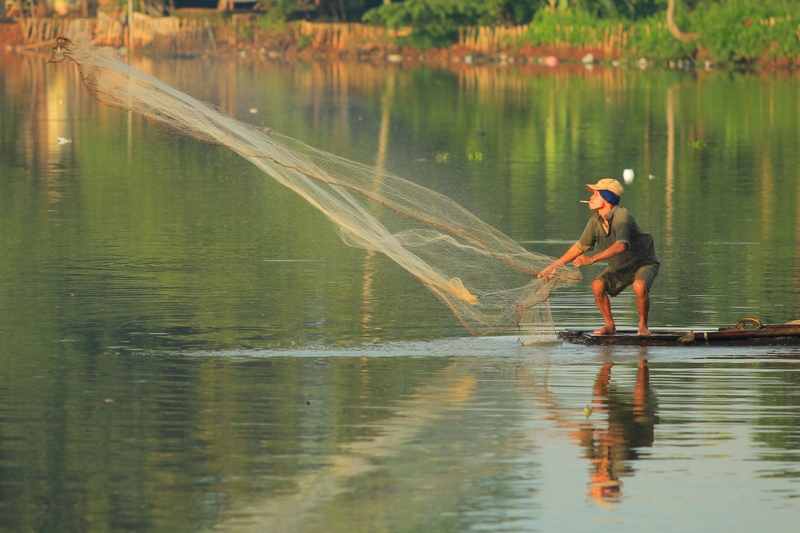 We went to Pamulang Lake, close to his house, and found a man catching fishes with his net. I asked him about the man’s name, but he doesn’t know exactly. He just knows that he is called Ki Jongkok (squat). Before he throws his net, he always in a squat position. Since he was quite far from the lake side, I used a tele lense (70-200 mm) to captured his fleeting action when throwing the net. I uploaded this image to Pixoto and got the best of the week photo last week by the community. This is the second image that got some award from Pixoto community. Here is the first image. Talking about fleeting moment, actually this entire life is a fleeting moment, compare to the eternal life of after life. Before our time come, we should give the best to the world, according our believe, of course. The verses were quoted from here. masih kurang paham fleeting itu maksudnya apa? Kalau secara harfiah, sebagai kata sifat, fleeting lebih kurang artinya sekelebatan atau sekilas atau sekejap. Sebagai kata kerja bisa berarti menghilang secara perlahan atau bergerak dengan sangat cepat. I love this photo, but I love the story even more! Oh Naomi… that’s very kind of you.. Thank you for visiting and dropping a lovely comment. I try to join the weekly challenge with the story as part of my Untold Contemplation. Ping-balik: Weekly Photo Challenge / B4 Retouch: Fleeting / Mont Beuvray View | What's (in) the picture? Ping-balik: Weekly Photo Challenge / B4 Retouch: Fleeting / Dead Tree | What's (in) the picture? Ping-balik: Weekly Photo Challenge / B4 Retouch: Fleeting / Dead Tree 2 | What's (in) the picture? This is a beautiful stop action shot. Congrats on your win! Thank you so much Madelaine. It was worth the time I spent circling the lake 🙂 He was always in the move. Ping-balik: Weekly Photo Challenge / B4 Retouch: Fleeting / Mont Beuvray View 2 | What's (in) the picture?